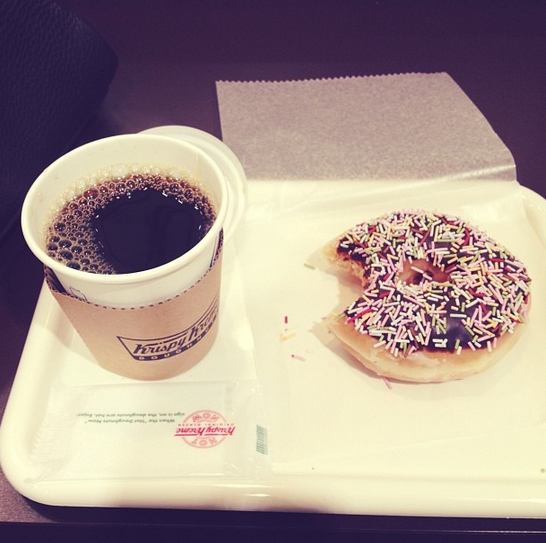 I just finished working, stop in a Kawasaki station Krispy kreme with nose full of snot and eyes watery with tears. I order a chocolate glaze with rainbow sprinkles. I forget how to say some words and smile the stupid foreigner smile, the Japanese lady gives me the stupid Japanese looking at stupid foreigner smile back. The boy sitting next to me is reading a book. We both sit at a countertop facing the clear glass wall that separates us, the donut eaters, from the rest of the train station’s frantically moving passerby’s. The boy’s face remains profile with spikes of hair gently floating in his face, I will never know if he is as cute as I imagine him to be. A man takes a seat to my left, he has three donuts and a coffee on his tray. I wonder if he too will be eating his feelings, if so, he seems to be having a worse day than me. On the train our seats face each other like booths at an old diner with no tables in between. I sit with my legs facing outwardly towards the aisle to avoid my knees from bumping into the girl sitting across from me. Across the aisle are four more front facing seats. There is a man sitting by the window, his face reflects in the glass beside him, fading and reappearing, flickering at each passing street light. He has just one wire tethered into his ear, but there is no other headphone dangling searching for another ear to fill. It is connected to a silver box, not phone, not recognizable mp3 player, it is rectangular and slim with no noticeable buttons or hingers. He holds it up close to his wired ear and stares directly ahead into nothing. It’s a spy device, he is a spy. I look cautiously within my peripherals to find the object of his amusement, but I see no one distinctive. He is bald, with grey speckles of hair and small dots of age lining his ears. Mounted on them are a set of tortoise shell glasses. His jacket is black and appears to be water and wind resistant. His pants and shoes reflect the same boring lack of persuasion as any salary man. I casually raise my coffee cup to my lips, tilting it, as in slow motion the lid slips off and fresh hot coffee pours down my jacket and hand, the rest dribbling from my mouth down to my chin and onto my scarf. I dab the spots of coffee on my chin and reach into my pocket for a pack of tissues, but my damp fingertips find only crumpled balls of used booger soaked paper. I lick a drop of coffee that rolls down my hand, and wipe the rest from my jacket. I look in the bald mans direction, I hope you got that on your spy cam, I lament.